Despite all the hyperbole about the Internet advertising market M&A activities, I am surprised at the lack of critical perspective about the consolidation of cookies being placed and managed on users' computers without their knowledge. The recent spamacornucopia means more than $10 BILLION DOLLARS OF YOUR DATA IS BEING EXCHANGED AMONG BUYERS AND SELLERS THAT YOU DON'T CONTROL, starting with DoubleClick (and H&F their private equity owner) and Google, and then Right Media (Redpoint) and Yahoo!, and then 24/7 and WPP, and now aQuantive and Microsoft. I have heard that a profile is worth a dollar. One could assume that a clickstream is worth $10. We know, after all, that a mortgage lead can be worth more than $100. How much is a cookie worth? As in, how much does it cost a company now on average to place a cookie on a user's desktop? Of course the folks at Tacoda, Blue Lithium and Revenue Science would know this with more granularity, but my sense is that a cookie is currently worth about $.10. Please comment below if you have additional perspective. 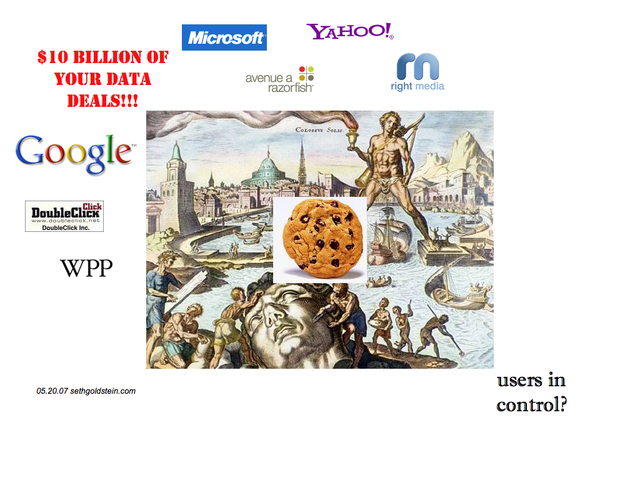 And so, the $10 billion dollars worth of online advertising deals would equate to about 100 billion cookies served. Do we as users have any sense of this reality, or any control over its consequences?